For a while now I’ve been looking for a decent client that I can plug into the back of TV’s around the house to stream media and LiveTV without forking out a tonne of cash. I’ve looked at the Raspberry Pi, Apple TV 2 and 3, Boxee Box, Acer Revo and many many more small computing clients that claim to have this functionality. I was seconds away from ordering a Boxee Box, until I found that the operating system was completely closed source and I’d be back to the restrictiveness of Apple TV.So I started looking at other x86 architecture clients. I only really wanted something that would run XBMC, nothing as heavy as Windows. Full HD and Blu-ray compatibility was a must, along with a HD audio output, which narrowed down the already small list of options. I also didn’t want to spend more than £150. I figured that £150 is about the same you would pay for a DVD recorder with Blu-ray functionality. Since we are also looking for a solution for our front room, I thought getting something now would be a great test to see if it would work around the house. 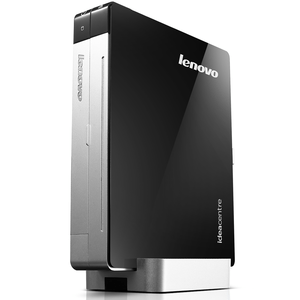 I stumbled across (by chance) the Lenovo IdeaCentre Q180 Nettop, and found a pretty good deal with eBuyer. Ordering through IBM’s internal employee reward scheme also gave me a lovely bit of cash back too, lowering the price even more! I’m going to save the good bits about the Q180 for tomorrow, when it should arrive. I’ll be sure to get a review up as soon as I’ve finished setting it up. But here’s a video to tease you. ← Raspberry Pi – Ordered!